Now you don't need to ask anyone or wait for getting the address and timing of a Sahaja Yoga Center...!! Quickly search for the nearest Meditation center so that you may rejuvenate your life without wasting the precious moments. 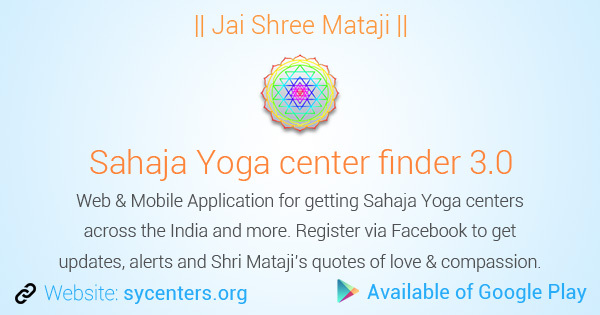 Download the all new Sahaja Yoga Center Finder App on your personal device(phone, tablet, etc) and share the center details to the new seekers or to Sahaja Yogis relocating to another places. Very easy to find a center anywhere in India (also started adding centers of abroad), as the centers are enlisted by States and then cities. The App has been updated with the current center coordinators details, location on map, and the strength of a particular center. You can also add a center, if you don't find it on the App or update the correct information about centers. For sharing the Center Details, options like Mail and SMS are provided, making it easier to send the information. Also, a new feature of Reminder has been added in the App. Now you can set up a reminder alert on your device for the center which you wish to attend, so no chances of missing the collectivity. "Information related to Public programs can also be received from the App. Also if there is a PP nearby your area, you can update on the App, so the entire collective may know about it." So Download the new Sahaja Yoga Center Finder App on your device now and get ready to spread Mother's love, thereby inviting the new seekers on our Meditation centers and become a part of the Collective. Because app is only for Android. Others can use website http://sycenters.org/centers. It's complete mobile friendly. Share this website to your facebook timeline !! !